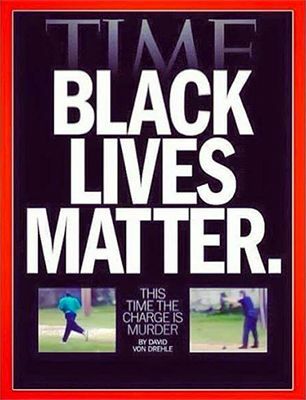 The cover story of Time magazine this past week is "Black Lives Matter." Yes, they do. And so do brown lives and lives of every shade of humanity. It is high time white people said as much, acted accordingly, purged our racist attitudes, and got over our defensiveness against discussing racism. "We don't want to be held responsible for bringing Africans to these shores as slaves over two centuries ago! "Of course not. But the fact remains that it happened. Black people continue to suffer for it. White people continue to have the upper hand in America. And the playing field isn't level. "We're not all racists! "No, but some of my more candid black friends have helped me understand the difference between personal and institutional racism. And there is still far too much of the latter for anyone to deny that there are no personal advantages that we get to claim when our skin is lighter. "We have elected a black president in this country and declared the laws unconstitutional that oppress black people! "The issue isn't public office and laws. It is hearts — and whether or not very many have really changed when jails and morgues are overpopulated by black bodies and church pews and pulpits in the suburbs (along with boardrooms, classrooms, etc.) are underpopulated. Both white and black persons have a problem with racism. "We are a 'justice-for-all society' in America, with courts and police departments that protect..."Okay, I don't even have the impudence to finish that one. I've never been stopped and frisked, denied admission to college, or shot in the back for running away from a policeman. So I don't really "get it." But I know it when I see it — and must never turn a blind eye to it in any context. The "Black Lives Matter" magazine cover and hashtag trending on social media got their ultimate authenticity from the death of Walter Scott — shot eight times in the back by a white policeman who was being filmed. Even more repulsive and detestable things have been done to black persons — women and children, as well as men — that weren't caught on camera. Justice will never be done for those insults, violent assaults, rapes, and murders. But the white majority can never again say it doesn't know. Doesn't believe. Hasn't seen. America has a problem with racism. The church has a problem with racism. Both white and black persons have a problem with racism. And we will all continue to have a problem with it until we admit, confess, and repent of the still-too-present past and far-too-persistent prejudice that still haunt our world. 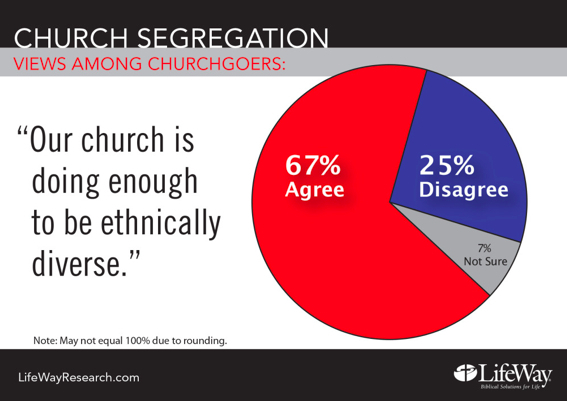 The survey taken before the latest wave of violence against African Americans is from the article, "Is Sunday Church Service Still the 'Most Segregated Hour in the Nation'?" in The Blaze. The images of hands being held in church are "Members of the audience clasp hands during the dedication ceremony for the Rev. Martin Luther King Jr. Memorial in Washington in October 2011." This image comes from America: The National Catholic Review article entitled, "Sunday is Still the Most Segregated Day of the Week." "Black Lives Matter" by Rubel Shelly is licensed under a Creative Commons License. Heartlight encourages you to share this material with others in church bulletins, personal emails, and other non-commercial uses. Please see our Usage Guidelines for more information.